Captain Marvel is the lead film into the Avengers End Game film releasing in April 2019 and Marvels first female lead superhero film. 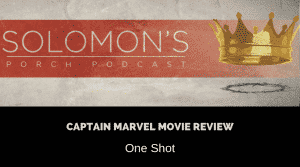 We share our overall thoughts on the film and address the pros and cons of Captain Marvel. For more content subscribe to the podcast and visit solomonsporchpodcast.com.